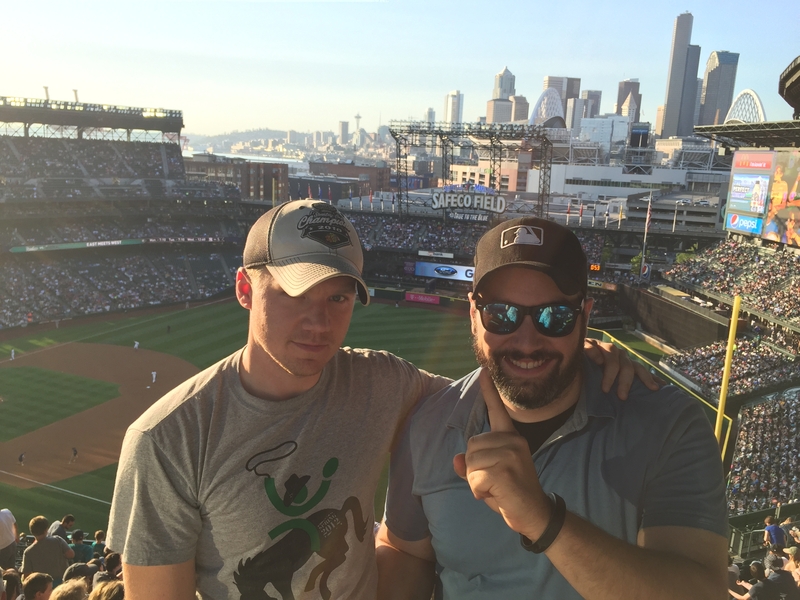 30in30for30 – Page 10 – Every Ballpark, Every Day. 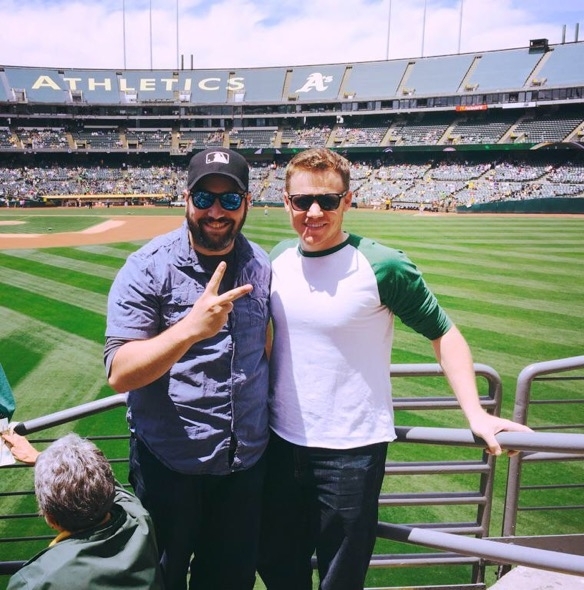 Thanks for finding the blog, please enjoy the video we made reviewing O.Co in Oakland. This is game 2 of 30, in our quest to see 30 games in 30 days. Thanks again for all of your support, online and in person. It is so great to meet and interact you! We made it to Oakland! Before heading into the stadium, we quickly previewed our second game. Excuse the bags under our eyes! 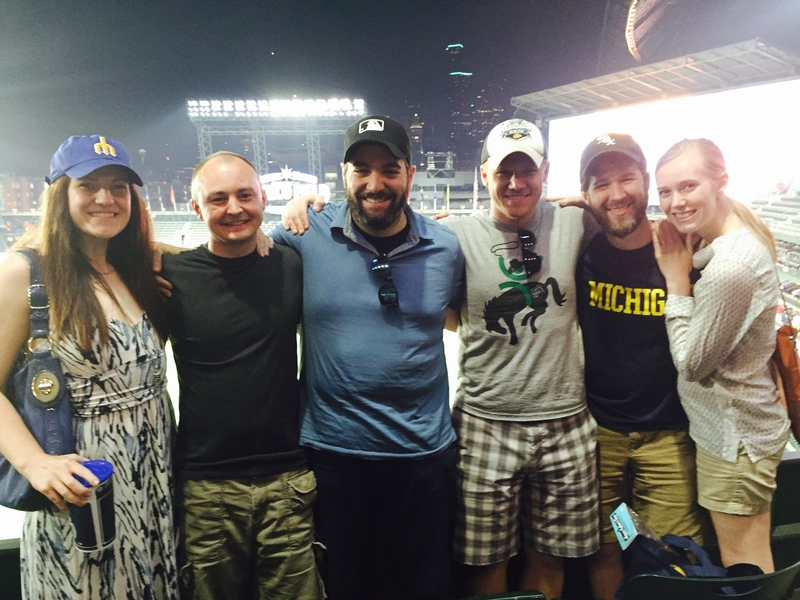 We had a blast at Safeco at our first game! Unfortunately, we have to drive through the night to make it to Oakland by first pitch. Not exactly ideal conditions for writing a post. In the meantime, please enjoy this video recap of the game. After our extensively exhausting 30 hour trek across the country, we had finally made it! Our friend Hayley was nice enough to put us up for the night in Seattle. Sleep never felt better. We had considered the size of the vehicle, the time availability, and the accessories required (sleep mask, ear plugs, etc.) for proper sleep throughout our journey… but never once had we considered the actual mobility of the car. Turns out, twisting and turning through the mountains did not prove conducive to sound sleep. Hayley’s house was very much immobile. 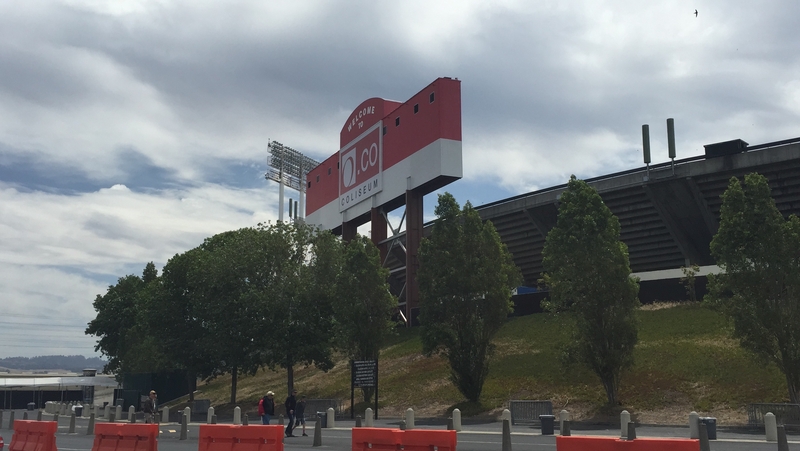 We reviewed transportation options and decided to park near, but not at, the stadium. We found fairly inexpensive parking in downtown Seattle that was nearby both tourist attractions and the ballpark (www.seattle.gov/epark proved helpful). 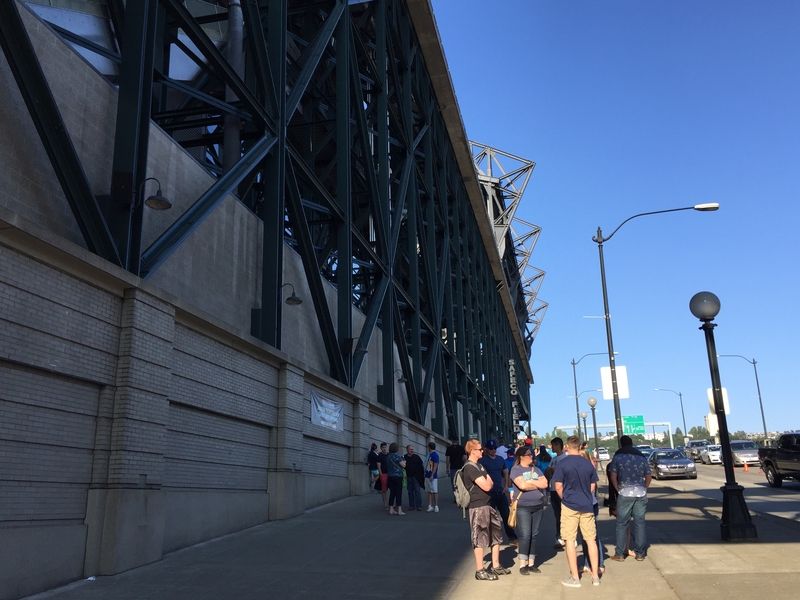 As we approached Safeco, we walked right by its neighbor, CenturyLink Field (hosts Seahawks football and Sounder soccer games). 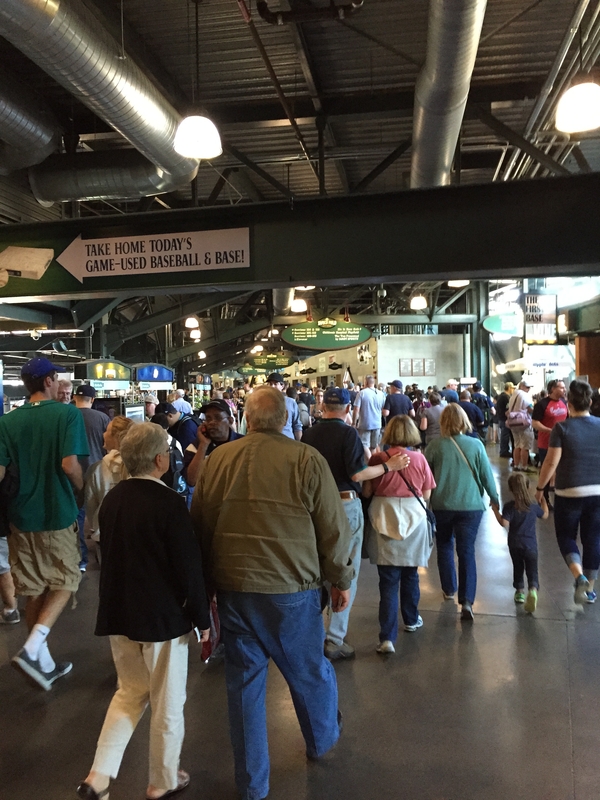 The pathway between both stadiums (Occidental Ave) serves as a defacto fan walk-up area where street vendors gather to sell food and merchandise. The standard peanuts and hot dogs were there, but many of the vendors offered different and more interesting specialized foods. If you’re looking for change up in gameday cuisine, give it a look. Giant, exposed green metal beams protruded from the top of the stadium, and while that doesn’t exactly sound inviting, the stadium itself had a very welcoming, almost suburban-home feel thanks to its white and red brick facade. The signage was modern and appealing. The stadium staff was plentiful and helpful. Just avoid 1st Ave if approaching by car (we saw 4 people get pulled over there in just the 10-15 minutes we were walking around the stadium, for doing seemingly harmless things). 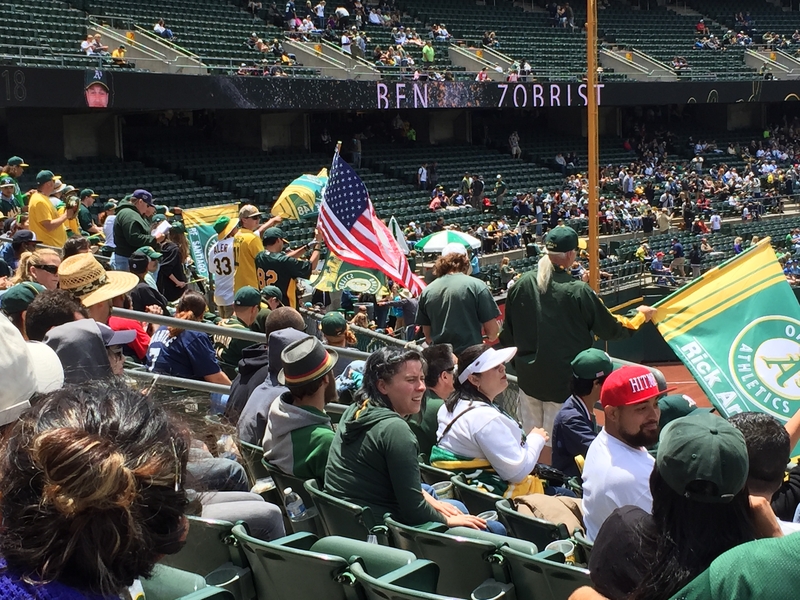 The walk-up and online ticket prices were fairly expensive: $25 for cheapest upper deck and $45 for cheapest lower deck. We opted for the cheapest upper deck seats, thinking the seat location would be fairly inconsequential as we traversed the park. Turns out, we hit the jackpot and didn’t even know it. More on that later. 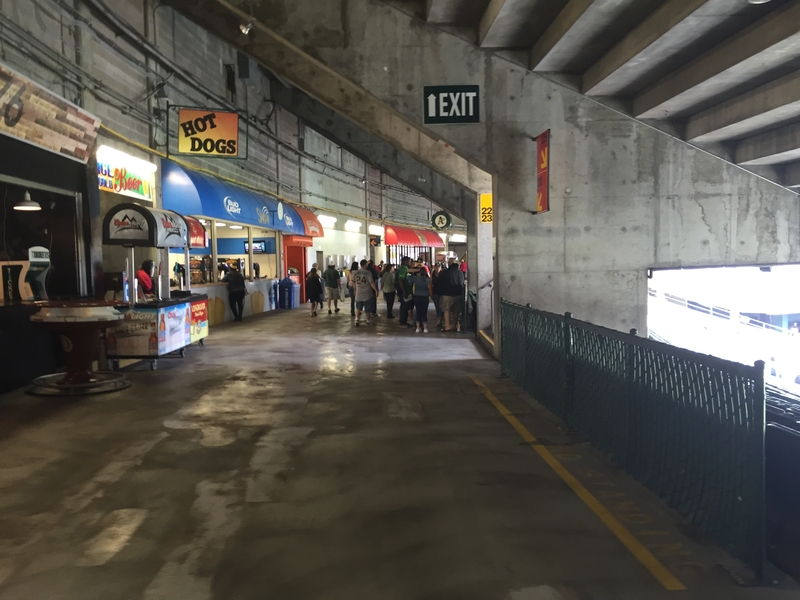 The inside concourses of the stadium have a very modern-industrial feel, large exposed HVAC pipes and very focused lighting are prevalent as the entire interior of the park featured the same exposed green metal and white brick as was visible outside the park. Signage was frequent and informative. Despite having never been here before, we indeed felt right at home. We had finished our tour and made our way to the seats where a ticket usher greeted us and checked our tickets. 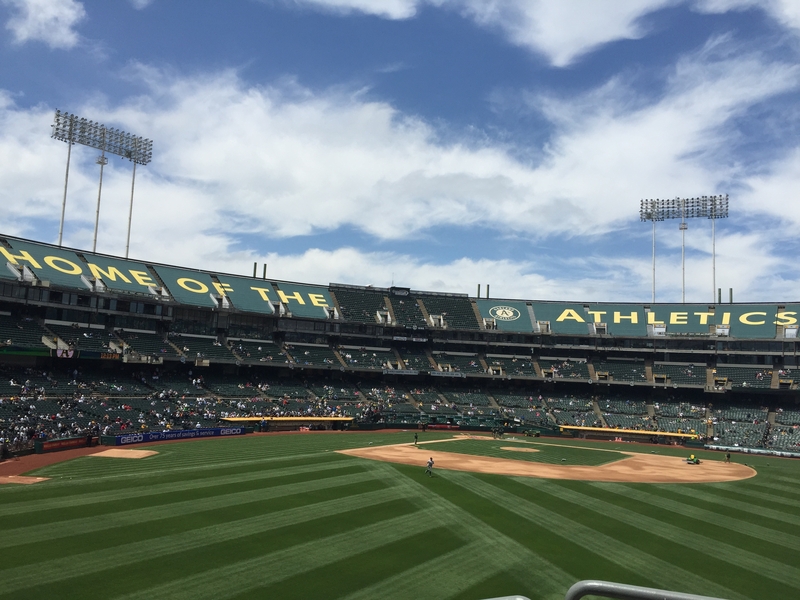 She laughed and pointed upward, “You’re in the penthouse” she snickered, “the very last row.” She wasn’t lying, we were literally in the last row of seats in the entire ballpark. As we marched up the seemingly endless rows of stairs, we were sure these seats would be awful. They turned out to be the show-stealer. Any seats in the upper deck down the 1B/RF line feature any absolutely gorgeous view of downtown Seattle. 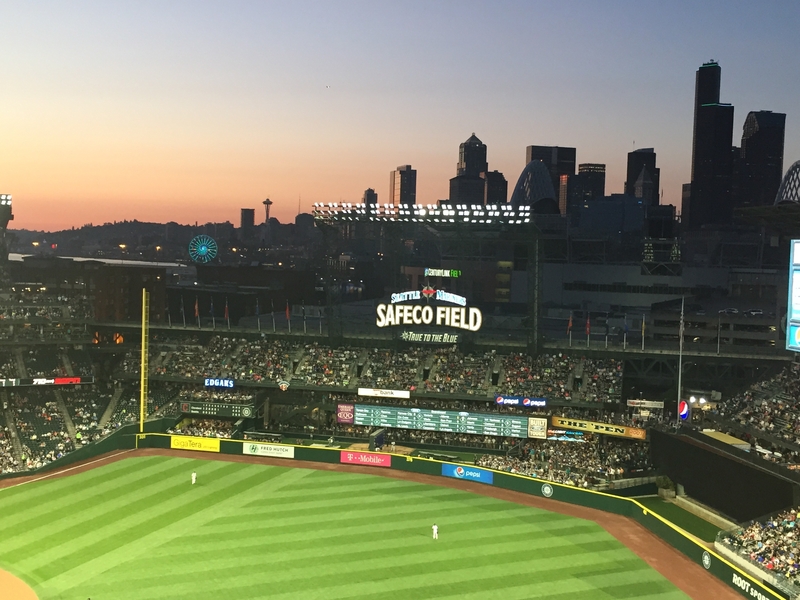 The Sound and its Ferris wheel, the skyline, and neighboring CenturyLink proved to be a breathtaking background for baseball. Around the park, we found plenty of family-friendly activities. 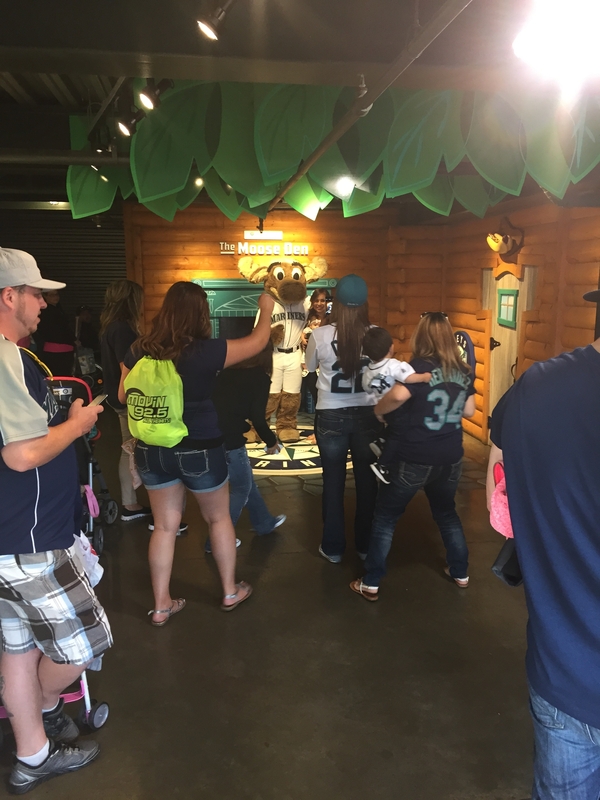 There’s an area for children to play in, a fast-pitch booth to test your fastball, and a den where Mariner Moose (mascot) was taking photos. For the adults, there was a large and very popular sports bar in LF and plenty of interesting food options (seafood & chowder was a personal favorite). There was also “the train” which would blow its very, very loud horn about once an inning and whose tracks lie just outside the stadium behind CF/RF. 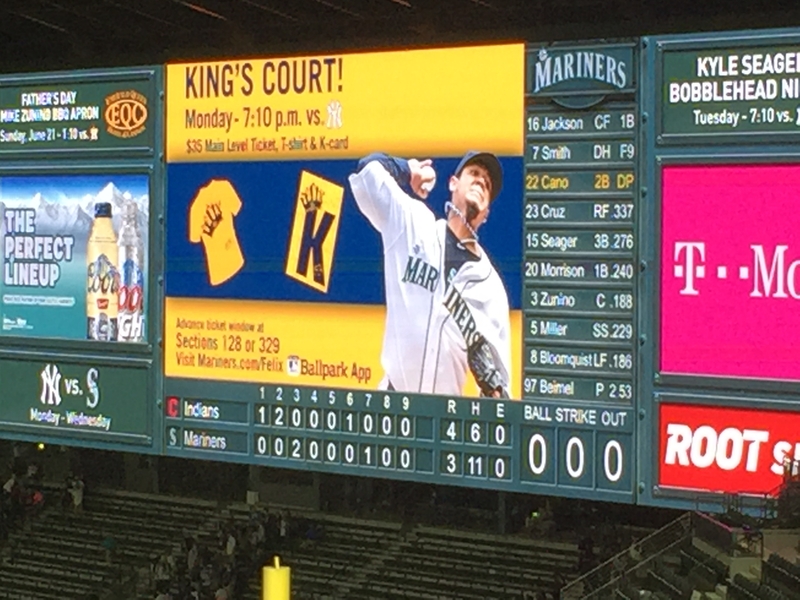 The video boards (MarinersVision) were very impressive and featured truly entertaining content. Simple player information became fodder for humorous puns or wordplay and the standard half-inning races or shell games had interesting twists. The Mariners, having heard about our journey, gave us free gift bags that featured plenty of Mariners merchandise to wish us well on our way. Definitely something they didn’t need to do. Thank you! 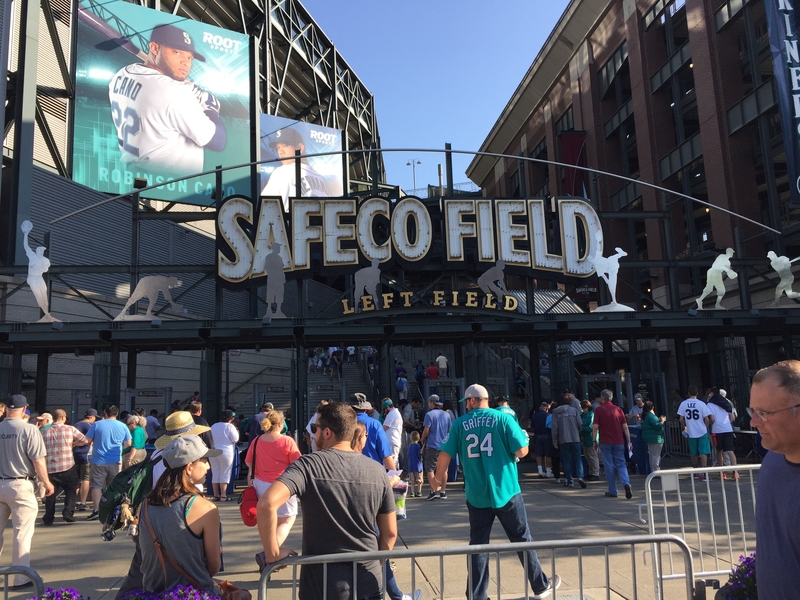 Safeco was beautiful. Its views were stunning. It was entertaining and accommodating, irrelevant of the day’s game. Its fans were ok, but did not meet our expectations (full disclosure: that could be a problem with our expectations). It was a great start to the trip. Sadly, we barely had any time to savor the stadium. 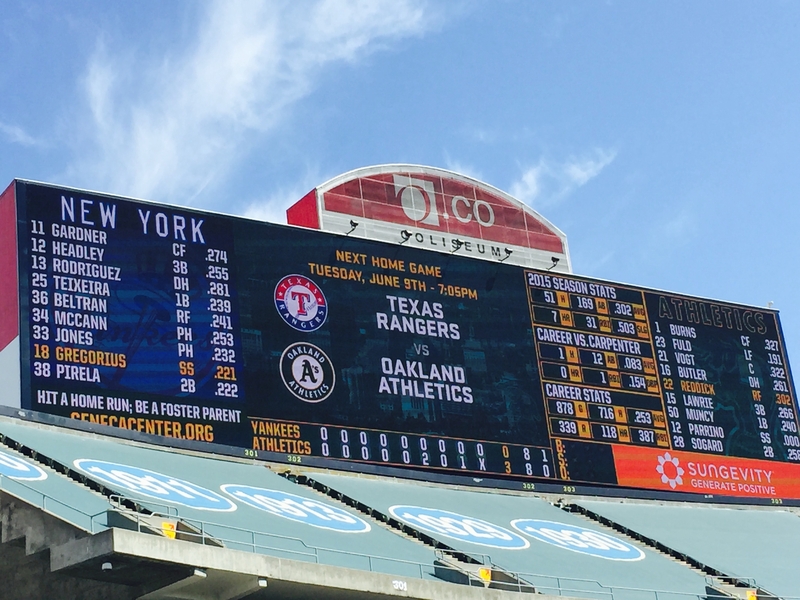 We had 13 hours until our next game in Oakland and a 12 hour drive ahead of us… see you in California. We intentionally planned to tackle the toughest drive first and boy, were we right to do so. Minnesota brought persistent rain and annoying stretches of construction. 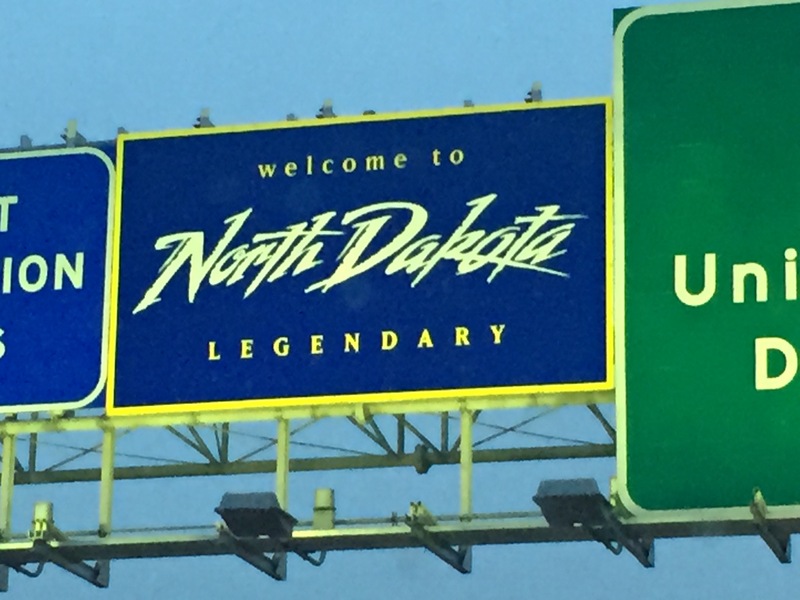 The rain stretched into and throughout North Dakota, but the construction was replaced with a surprising coldsnap. When we set out in 80 degree weather in Illinois, we most certainly hadn’t anticipated mid-40s just a handful of hours later. 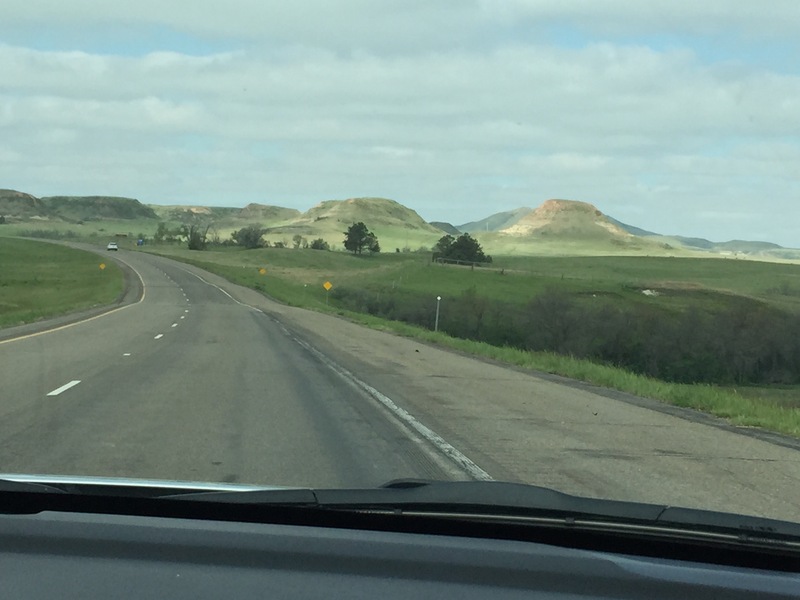 All of this was in addition to the stark and unremarkable (read: boring) landscape of both states. 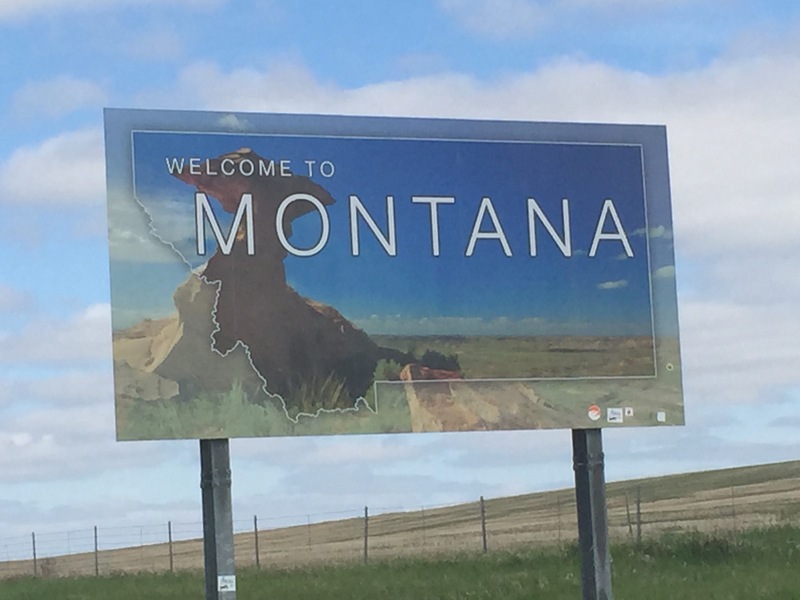 We’re now in Montana, where we’ll spend as much time driving as we did in Minnesota and North Dakota combined. No sooner had we cross the state line when we saw a group of actual cowboys. The weather has warmed, the landscape has become interesting, and the clouds have all but evaporated. Things are looking up. Until we realize that we’re only about halfway to Seattle. Brian brought a sleeping mask and slept for 5 hours. Tim did not and slept for 2 hours. The outlet adapter, which is a fairly important lynchpin in the ability to work remotely, has already burnt out. Some ups, some downs, a lot of average. Perfect symmetry for a baseball trip. 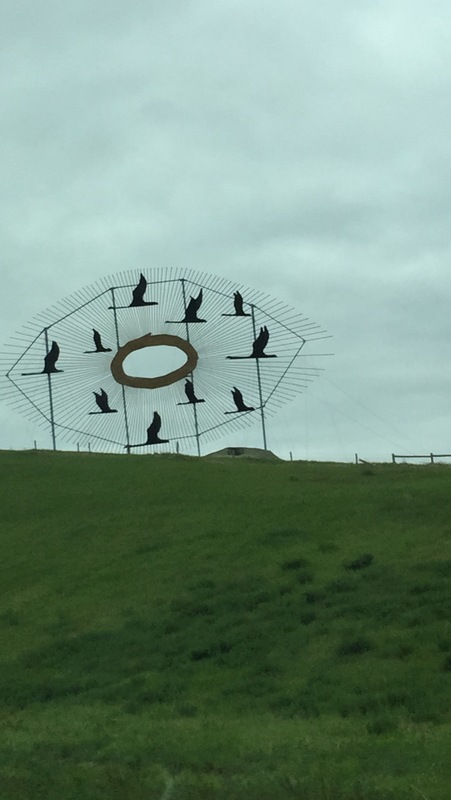 Oh, and some really weird goose statue. We are officially on the road!! Left Chicago this evening, proceeded to hit several stores to pick up some last minute items, and now we’re cruising through Wisconsin en route to Seattle. Just think: in 24 hours… we’ll still have 3 more hours of driving left. Whoa. 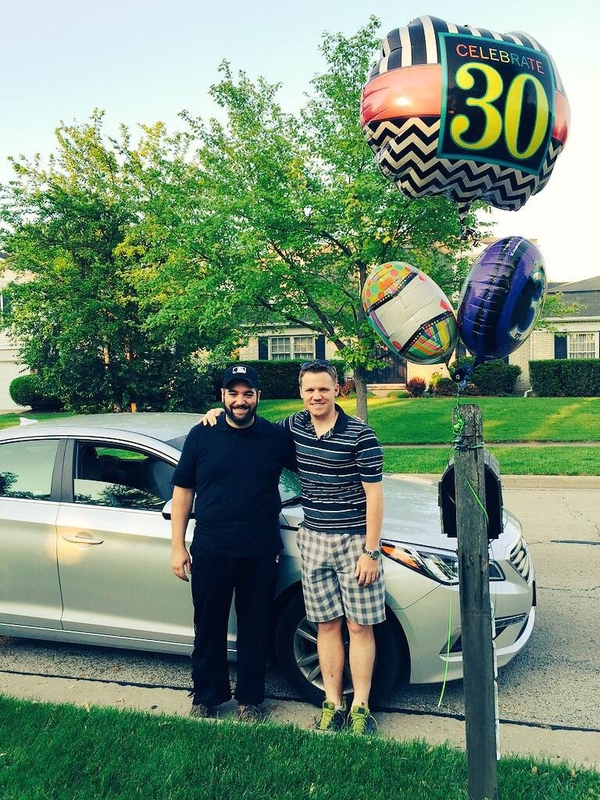 But do not fret, we’re crisscrossing the nation in style in our silver 2015 Hyundai Sonata; surprisingly roomy and came with XM radio. We have more technology running through cigarette lighters than should be humanly possible. Brian came prepared with Game of Thrones on tape, as well as lingual courses in Spanish, French, and German… so dass wir tatsächlich etwas lernen. We’ll try to post some vids later. Make sure to check out our tweets for more up to the minute information. Here’s to the journey ahead! Posted on May 28, 2015 June 1, 2015 Categories UncategorizedTags On The Road2 Comments on And So It Begins!